With the introduction of digital voice radio systems on VHF/UHF bands basing on the protocol DMR (Digital Mobile Radio) a very close co-operationship with Hytera Mobile Radio Germany GmbH was established. Hytera Germany represents a fusion between HYT in China and the Rohde & Schwarz - Digital Branch in Germany, a very well known and famous manufacturer of different radio systems for military, marine and aeronautical applications. Since then we are taking care of different projects on this field. The short form of Hytera "HYT" means Hao Yi Tong" - translated into English "Good and Easy Getting Through". This is also our target! We are YOUR competent contact partner and system integrator for projects in Germany and China and offering solutions ready to deploy! On this page we would like to introduce you to the digital voice standard "DMR" and also to the products belonging to it. Digital Mobile Radio (DMR) is an open digital protocol (or waveform) for digital voice or data on VHF and UHF bands, created by the European Telecommunication Standards Institute (ETSI). Among voice and data, DMR offers a lot of more features and opportunities, whether in conventional or in trunking systems. Because of its open standar-dization it is world-wide recognized and well deployed. DMR radio systems are using a channel spacing of 12,5 kHz and therefore are compatible to the most radio bandplans and radio spectrum, which is used for analog radio systems in most countries of the globe. Furthermore, all radios may be operated within in existing analog radio networks also! With that, radio solutions basing on DMR standard are providing an easy and cost saving migration from analog into the digital world. The HRT PD-785/785G is primarily targeting to users in the industrial and security relevant sector. It is very durable, water- and dust proof and it will survive the one or the other puch. It is the most requested HRT, which provides the most feature for an affordable and reasonable purchasing price. The HRTs PD-785 and PD-785G (Version with GPS) providing a high usability and reliability with all the user is in need of, when in a critical deployment. The world-wide patented industry- and antenna design assures the high usability and superb sensitivity of the GPS receiver. The PD-785/PD-785G meets all requirements of the open ETSI standard DMR, as well as of MIL810 - C / D / E / F / G and degree of protection IP67. The device series thus offers excellent features even under harsh operating conditions. Large pushbuttons ensure the handheld radio is easy and convenient to use. The large TFT color display enables good readability even when light conditions are poor. More than 20 programmable keys allow quick access to the various services and functions. Compared to the analog technology and the FDMA process, with TDMA the battery service life can be improved by approximately 40%. With the combined application of the narrow band codec and digital technologies for error correction, the radios ensuring excellent voice quality even in loud environments and in peripheral areas of radio coverage. Upgradeable software makes the use of new features possible. By altering the firmware, other digital and analog operating modes can be enabled, without the need for purchasing a new radio device. Our "I-Phone" among the end-user units for digital voice communication is targeting to those, who are in essential need of a covered bearing in conjunction with a full functionality and usability. It already includes the options "mandown" and "GPS" and provides the same durability as the HRT PD-785. The highlight is the flat construction of the corpus with dimensions, which only one can find at smartphones. Therefore the user may bear it concealed under a jacket or a suit. With the aid of the integrated GPS module the X1p can send position information to dispatcher systems, for example. Dispatchers can evaluate this information and use functions such as geofencing, radio localization and GPS tracking. The X1p can also determine and display the distance and direction to other radios with GPS support in the DMR system. Wireless audio accessories from Hytera can be connected directly to the X1p. As such the radio can be carried conveniently without having to route cables through the clothing. The X1p was developed in compliance with the ETSI Digital Mobile Radio (DMR) standard. It supports both conventional DMR operation (DMR Tier II), DMR trunking (DMR Tier III). The X1p can also be operated in analog mode. Along with conventional analog radio it also supports analog trunking as per MPT 1327. Provided the X1p is registered in a DMR Tier II system via a repeater, selective calls can be made from the radio directly to the telephone network via this repeater. Telephone subscribers can also call specific individual radios or also groups. Upgradeable software makes new features possible. By altering the firmware-software, other digital and analog operating modes can be enabled without the need for purchasing a new radio device. Encryption with encryption algorithm ARC4 (40 bit) in accordance with DMRA or with optional algorithms AES128 and AES256 (128 and 256 bit) ensures secure communication. Like all Hytera DMR radios, the X1p supports the usage of both timeslots in the direct mode (DMO). In this way two calls can be made at the same time in the same area. The HRTs of the PD-600 Series /PD-685/PD685G and PD-665/PD665G are the ideal buddies for the migrations into the digital voice operation. They are having a light-weight corpus and are supporting anlog, as well digital voice operation. Thanks to the fully featured keypad (PD-685), respectively the 3 programmable function keys and the bright LCD display, the radios are easy and uncomplicated to use. Even that the PD-600 Series does not provide an expressively marked distress pushbutton in sgnal colors, the system integrator may assign any function key as such. However, the radios are providing the full distress functionalities of the larger sister-models. The PD-600 Series is the affordable entry into the digital world by providing the nearly full functionality of digital radio networks according to Tier-II. 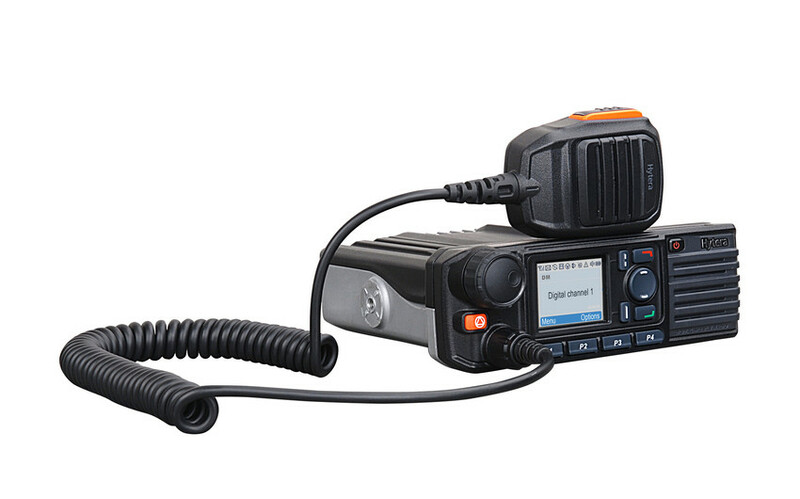 The handheld radios of the PD-600 Series are only 27 mm deep, making them absolutely compact. They are encased in a high-quality aluminum metal frame and with a weight of only 310 g (PD-685) comfortable and easy to bear for long deployments. With the lithium-ion battery with 1500 mAh included in the delivery, the HRTs achieving a deployment time in digital operation of at least 16 hours. With the optionally available 2000-mAh battery, it will even be 20 hours. The HRTs were developed in compliance with the ETSI mobile radio standard Digital Mobile Radio (DMR). The HRTs supporting the conventional DMR operation and can also be operated in analog mode. That makes them the ideal companion for the migration into digital mobile radio (DMR). For deployments in areas with explosive or combustive atmospheres (e.g. chemical facilities) the PD-795 Ex was developed. It already contains the GPS unit, as well the mandown option. Only the maximum output power is limited to 1,0 Watt, accordingly to the ATEX requirements, in all other technical aspects and its usability it is equivalent to the HRT PD-785G. The PD-795 Ex handheld radio complies with all the requirements of the European ATEX directives, IEC guidelines and the North American FM standard. Furthermore, the handheld radio terminal meets the MIL-STD-810C/D/E/F/G standard and is dustproof and waterproof in accordance with degree of protection IP67. The PD-795 Ex is there-fore ideal for secure and reliable use even in potentially dangerous conditions. The use of batteries or accessory components with a lower level of protection automatically triggers an alarm so that errors of this type cannot occur. Both the radio and the battery are encased in a plastic housing to ensure that all internal connections are protected and sealed off from dangerous explosive gases and dust particles. Integrated GPS as Standard Using the integrated GPS module, the PD795 Ex can send location information to dispatcher systems. Dispatchers can evaluate this information and use functions such as geofencing, radio localization and GPS tracking. The PD-795 Ex is waterproof and dustproof in accordance with an IP67 degree of protection, which means it is capable of withstanding a water depth ofone meter for at least half an hour.The upgradeable software makes the use of new features possible. By altering the firmware-software, other digital and analog operating modes can be enabled, without the need for purchasing a new radio device. For the permanent installation into official vehicles or the permanent stationary operation we offer the powerful MRT/FRT MD-785 (MD-785G with GPS). It corresponds in handling, operation and menu structure consequently to the HRTs of Hytera. Somebody who can handle a handy-talkie, can do likewise with the MRTs and will not be in need of any further instruction. The MRTs are available in 2 different versions, 25 Watts (L) and 50 Watts (H). H versions are available upon request only. In addition there is a wide variety of mounting material (remote heads), as well various microphones and handsets (with and without keypads) available. Thanks to the simultaneous application of narrow band codecs and digital error correction, the MD-785/MD-785G offers you outstanding audio quality in loud environments and in boundary regions of the radio coverage. The MRT features an analog as well as a digital mode and is compatible with the currently used analog systems, thereby simplifying your transition into the digital age. The MD785/MD785G complying with the standards MIL-STD-810 C/D/E/F/G and meeting the IP54 degree of protection. A high degree of reliability is assured even in harsh environments. Besides the traditional communication functions, the MD-785/MD-785G feature numerous digital and optional functions, including text messages, GPS location determination and a lone worker function. Thanks to the expansion interface, the range of functions offered by the MD-785/MD-785G can be expanded to include key functions. Accessories and applications developed by partners can be connected to this interface. The FRT MD-655 is especially suitable as fixed radio terminal for data communication. telemetry and remote control. It is predistined for the transmission of alerting messages, remote control of signalling devices, for doors, gates or intercomms, as well for the transmission of technical values within digital radio networks. It may also work in DMO, where there is no network infrastructure. If connected with the optional remote-control-microphone an extension to a small land-mobile radio (MRT) is possible, where the black-box will be installed in the trunk and the microphone will be in the drivers cabin. With that there is a MRT available, for vehicles with limited space. The base transceiver stations (BTS) or repeaters are representing the network/system infrastructure and with that are being an integral part of a digital radio network. The network infrastructure ascertains the radio coverage within larger regions, different territories located apart of each other or within larger, complex buildings, whereas it makes no difference, in which part of the globe a BTS is being installed. The connection of the BTS among each other will be done by the so called "IP-Site-Connect" which makes use of an IP-basing network connection. In this way the user gets the opportunity to talk with another subscriber, who is located in a distant region (e.g. another city) or to talk with a remote long distance operation center (LDOC). Certainly there is also a remote control and diagnostic tool for a BTS, which offers a complete overview of the most important parameters of it. In order to do that, a technically trained person will use a special software (RDAC) on his service notebook and check into the system, where also alterations within the radio network can be done. In case of any malfunctions, the RDAC will omit a technical alert, that actions can be taken with immediate effect. The PC-based application can be used to monitor, inspect and control the RD625. The software supports network access from multiple points and allows administrators to monitor the DMR radio network all the time. The network may be secured against unauthorized use, also authorized subscribers may be limited to use only certain BTS in regional areas or establishing connections to a limited number of groups or call types. For different types of deployments there are different BTS, which we want to introduce you in further. With 50 Watts output power, the BTS RD-985/RD-985S are the leading edge. They are predistined to provide radio coverage within larger regions and as well for in-building/in-house coverage within larger, complex facilities or where several antennas and combiners shall be used. The RD-985 supports radio networks accordingly to Tier-II (RMO), whereas RD-985S is also supporting trunking networks accordingly to Tier-III or XPT (TMO) and in analog networks it may also support sumulcast operation. Both BTS are made as 19" rack device and can be easily integrated into installation rooms or into 19" racks. The RD985/985S can be operated both in analog and in digital mode and is completely compatible with the analog systems currently in use. The device can automatically change between digital and analog mode depending on the type of receiver signal and, thanks to the elimination of manually configuring frequencies and channels, both time and money are saved. The BTS offers constant power (up to 50 watts) and therefore meets the high requirements of all conventional digital radio systems. The BTS can be installed in a 19-inch equipment rack using an optional installation kit. Alternatively, you can easily install it on a rack, a mounting support or a work table. Thanks to the space intended for an optional duplexer inside the device, the device remains compact. Thanks to the TDMA technology, twice as many users can use the same channel, such as is the case with analog or digital FDMA systems. Due to the restricted frequency resources, this represents an important relief and reduces the expenses for system terminals and frequency licenses. The RD985 repeater features an enhanced digital encryption function that protects your communication against enemy (or friendly) eavesdropping or monitoring. Thanks to heat dissipation, the power amplifier can dissipate its heat exceptionally efficiently. In addition, the integrated fan system ensures stable and powerful operation. If the base station is operated on an analog channel, you can choose between operator or unmanned mode. In operator mode the base station can be used as a duplex transceiver. Since the repeater was designed according to military standards, it offers high reliability and excellent performance. Test results from independent laboratories have shown that the device can be operated for up to 100,000 hours without interference and it therefore meets the requirements for use in extreme situations. Whether during regular operation or an ongoing maintenance: The large LCD color display will offer all relevant information. The innovative illumination on the voloume knob provides additional usability. Thanks to the well designed menu and the large selection knob, the use of the BTS is very simplified. The 8 LED display on the front panel providing an easy identification of the current status. The slanted grips giving the opportunity of an easy installation or transport of the BTS. * = only version "S"
The base transceiver station RD-625 is an "allrounder" among the network components for digital radio networks. It is designed for either deployment, for regional coverage and for in-house installation within complex facilities, such as stadiums, shopping centers, airports. Due to the extreme small dimensions, the BTS may be easily and concealed integrated in existing house installations (e.g. on a wall inside a building or on the rooftop near the antenna). With its 25 Watts the BTS can provide a good coverage within a city. Although the dimensions are very small, a duplexer still can be integrated within the corpus of the BTS and furthermore, all the functionalities of digital radio networks accordingly to Tier-II will be supported. The BTS RD-625 repeater can be operated both in analog and in digital mode and is completely compatible with analog systems currently in use. The device can automatically change between digital and analog mode depending on the type of receiver signal, saving both time and money by eliminating the need to configure frequencies and channels manually. The integrated power supply of the RD625 automatically chooses between alternating current and direct current. This makes it possible to provide a fail-safe radio signal by connecting the repeater to an independent source of direct current (UPS) in addition to the normal supply of power. If the AC supply fails, the RD625 switches to the second power supply automatically. The RD625's well-engineered design makes wall mounting easy using the optionally available wall bracket. This makes it possible to install the repeater flexibly and conveniently in buildings. The RD-625 combines transmitter and receiver components, the voltage supply and the duplexer (optional) in its compact corpus. The RD-965 is a very special product in the landscape of Hytera system components, as it is a mobile and portable base transceiver station (mBTS), which is even suitable for outdoor deployments. The mBTS is completely waterproof and provides -with a powerful battery pack- an autonomous power source. Of course, it may also be operated with an ordinary power supply, which is connected with the DC power grid. All optional parts may be put into the optional backpack. The RD-965 is specially designed for temporaray deployments in uncovered mission areas, where there is no radio network infrastructure available, whether during a special event or due to devastation during a natural disaster like a flood or an earthquake. Certainly the RD-965 also may be operated as an in-house coverage network component. Even that the mBTS is very small in regard of its dimensions, it is a big gun in regard of its features! It contains everyting, what the larger sister products are providing, only the maximum output power is limited to 10 Watts, due to its special mission it has. The GPS module enables emergency control rooms to monitor the location of a small radio network in real time if the repeater is being used as a mobile unit. By connecting geographically distributed repeaters that run at the same or different frequencies to form an IP-based and location-independent wireless communication network, mobile radios can use voice and data services even when in roaming mode. The RD965 can be used with the RD-985 in a repeater network. RD-965 fully complies with the standards MIL-STD-810 C/D/E/F/G and conforms to the IP67 degree of protection, ensuring exceptional performance even in harsh conditions. The repeater supports up to 16 voice channels. The user can switch between channels using the PC-based RDAC software, the channel selector switch on the front panel of the device, or the external interface on the repeater. New functions can be integrated easily and smoothly using software upgrades, meaning the user does not need to buy a new device. All technical information provided on this page was determined at the factory and in accordance with the corresponding standards. Subject to change on the basis of continuous development.